Holders Tyrone turned on the power to breeze into the McKenna Cup semi-finals with a 1-18 to 0-9 win over UUJ. A 1-5 salvo from Sean Cavanagh and a man-of-the-match display by new boy Kevin Gallagher saw the Red Hands make it three wins on the spin in Section C.
Antrim and Derry both missed out on qualification after 1-13 to 1-13 draw. James Lavery's goal helped Antrim lead 1-10 to 0-5 but Daniel Heavron's goal helped Derry level as both teams missed late chances at Celtic Park. The draw left both teams on three points from their three games which was not enough to pip Fermanagh for the best runner-up spot going through to the semi-finals. 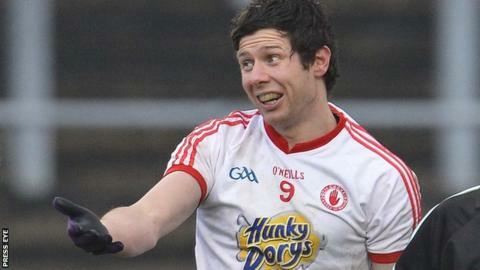 At Omagh, Conor McAliskey missed a 22nd-minute penalty but Cavanagh's goal helped Tyrone lead 1-9 to 0-7 at half-time. Tyrone took total control in the second half to run out 12-point winners. Early points from Mark Donnelly, Gallagher and Cavanagh were cancelled out by some excellent place kicks from UUJ's Richard Donnelly. Tyrone were awarded a penalty for Gerard McCartan's foul on Donnelly but McAliskey's kick was comfortably saved by Mark McReynolds. UUJ countered immediately to go in front through Emmet McGuckin but Plunkett Kane and Penrose combined for Cavanagh to slot home a 29th-minute goal. Tyrone outscored their opponents by 1-4 to a single point in the closing seven minutes,with Penrose hitting a superb score and Cavanagh converting a couple of frees for a 1-9 to 0-7 interval lead. It was one-way traffic in the second period with Plunkett Kane slotted over two neat scores and centre half-back Joe McMahon slicing over a long range effort. Tyrone finished in style, with McAliskey and Kane adding to the tally with stylish efforts. At Celtic Park, Mark Lynch and Charlie Kielt were among the scorers as Derry moved into a 0-5 to 0-2 lead but Antrim responded with an unanswered 1-8 to lead by eight points early in the second half. Antrim's scoring sequence included a scrappy goal by James Lavery with Ryan Murray and Paddy Cunningham also on target. However, Derry hit six of the next seven scores with James Kielt and the impressive Heavron both among the scorers. Heavron's 58th-minute goal left the minimum between the teams and Enda Lynn's point levelled the match before Gerard O'Kane cancelled out John Carron's lead point for Antrim. Derry had a penalty appeal turned down in injury-time as Colin Devlin claimed that he had been bundled over while tempers flared after the final whistle with a number of players appearing to aim blows at each other.